LP version. The Little Villains' debut album Philthy Lies is a half hour slice of rock-n-roll dream cake! Somehow as if heaven sent a rare treat, one can experience the exceptional and ferocious talent of the late Phil "Philthy Animal" Taylor one more time! Yes, the very same Taylor that provided the pioneering backbeats to all the albums as a member of the classic lineup of the iconic rock group Motörhead. Coupled with the solid hook-led songwriting and guitar craft from Mr. James A Childs who also fronts the desert rock band Avon, and the youthful thrashing energetic bass guitarist Owen Street of the Welsh sludge duo Vails, this makes for a killer combination. The band's rapport is evident throughout the record; their relaxed and candid approach and repartee is well-captured. Like a nomad scene from the Mad Max: Road Warrior (1981) movie, cars fully laden with instrumental weaponry speed across the desert. Tracks were laid for the album at Unit A Studios in Palm Springs, California in February 2007. Philthy Lies was produced and engineered on two-inch tape by Childs with Unit A's owner Robbie Waldman assisting the session. Recently, James has carefully carved the record's sound to maximum justice from the original tapes from mix to master, and it is some of his best work to date. Philthy Lies is a testament to Taylor's professionalism and is proof that he was still every bit the rock and roll giant, even 15 years after his departure from Motörhead. LP version. Limited edition color vinyl. 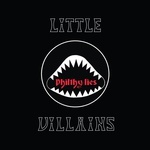 The Little Villains' debut album Philthy Lies is a half hour slice of rock-n-roll dream cake! Somehow as if heaven sent a rare treat, one can experience the exceptional and ferocious talent of the late Phil "Philthy Animal" Taylor one more time! Yes, the very same Taylor that provided the pioneering backbeats to all the albums as a member of the classic lineup of the iconic rock group Motörhead. Coupled with the solid hook-led songwriting and guitar craft from Mr. James A Childs who also fronts the desert rock band Avon, and the youthful thrashing energetic bass guitarist Owen Street of the Welsh sludge duo Vails, this makes for a killer combination. The band's rapport is evident throughout the record; their relaxed and candid approach and repartee is well-captured. Like a nomad scene from the Mad Max: Road Warrior (1981) movie, cars fully laden with instrumental weaponry speed across the desert. Tracks were laid for the album at Unit A Studios in Palm Springs, California in February 2007. Philthy Lies was produced and engineered on two-inch tape by Childs with Unit A's owner Robbie Waldman assisting the session. Recently, James has carefully carved the record's sound to maximum justice from the original tapes from mix to master, and it is some of his best work to date. Philthy Lies is a testament to Taylor's professionalism and is proof that he was still every bit the rock and roll giant, even 15 years after his departure from Motörhead.